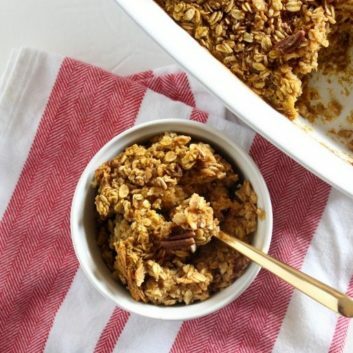 This oatmeal bake marries the maple flavor of traditional French toast with the spiciness of pumpkin pie. Let’s just say it’s a breakfast worth waking up for! Oats are a whole grain and great source of beta-glucan, a fiber that may lower cholesterol and boost immunity. And of course, fiber also does a great job of keeping you full for a while. Enjoy. Preheat oven to 350˚. Coat a large casserole dish with nonstick cooking spray. In a large bowl, whisk together eggs, egg whites, almond milk, vanilla, pumpkin puree and pie spice, and 2 tablespoons maple syrup until well combined. Add the oats and mix until combined. Top with remaining 2 tablespoons maple syrup, sprinkle on additional pumpkin pie spice and optional nuts. Bake for 35 to 45 minutes or golden brown and no longer wet. Serve immediately with additional maple syrup or honey. Store leftovers in the refrigerator, covered, for a couple days.